Fertilizer is something most people know is critical to a healthy lawn. If you want to really help your lawn prosper, you need to have a basic understanding of how fertilizing your lawn works and when to best apply fertilizer. Follow tips from the pros and you’ll be able to enjoy strong, thick turf all summer long. Lawn fertilizers contain organic or inorganic ingredients that are added to your lawn to improve its health and help it grow. 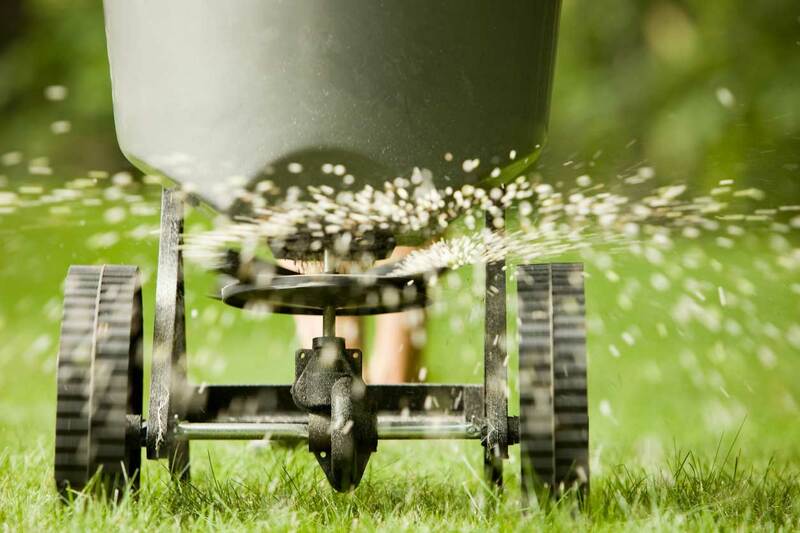 A good fertilizer provides your lawn with nutrients at the right time. Fertilizer provides 3 main macro-nutrients your lawn needs that are found in fertilizer: phosphorous, nitrogen and potassium (NPK). These are all naturally occurring in nature but will not be delivered at the right time unless you fertilize. (N) Nitrogen promotes faster growth and a healthier green turf. (P) Phosphorus stimulates root growth. The simplest answer is ‘trial and error’. Start with the most common fertilizer applications for the type of lawn you own and go from there. If you’re after a more exact answer, there is research available for all types of lawns and conditions, including applications for new lawns, established lawns, etc. Alternatively, you can perform a soil test. A soil test determines the health of your lawn, which type of fertilizer best suits your grass, and the acidity of your soil. With this information you can make a maintenance plan tailored to your turf. It’s usually recommended to fertilize in late summer and early fall, but frequency depends on they type of grass you have. There are both low maintenance and high maintenance varieties. Low maintenance varieties include red creeping fescue, Kentucky blue grass and only require fertilizing twice a year, in August and late October. High maintenance lawns such as improved Kentucky Bluegrass or rye grass varieties will need to be fertilized four times a year. Typically these grasses will need nutrition in August, September, October and again in May or June. One last thing to consider is the weather when you are fertilizing. The most ideal weather for plant absorption of fertilizer is a cool day with some rainfall. If rainfall isn’t in the forecast water your lawn following laying down the fertilizer to promote nutrient absorption and prevent fertilizer burn in your grass. Fertilizing your lawn may seem simple, but if you aren’t doing it right you could be wasting money. Contact us to get you started and get your lawn looking healthy and strong.